I recently came upon this 1983 catalogue of Raleigh’s high-end bikes, built (as I understand it) at their Ilkeston ‘special products’ division. In those days Raleigh was walking a tightrope between high-end aspirations (successful racing team in Europe, and great hand-built racers and tourers) and the pile ’em high shoppers and Choppers. 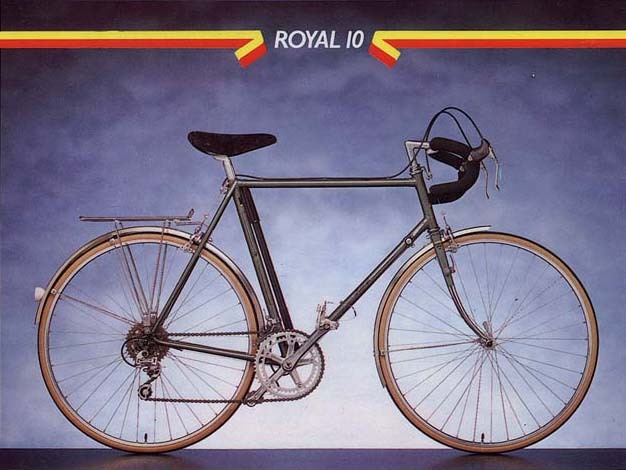 Nevertheless, they did get plaudits from the cycling press for these good-value quality models, which led to me buying a lovely Raleigh Royale that I rode from 1983 until this year (when I bought my gorgeous Paul Villiers Sportif). Raleigh Team Replica, Raleigh Gran Sport, Raleigh Road Ace, Raleigh Competition, Raleigh Record Ace, Raleigh Royale, Raleigh Royal, Raleigh Clubman, Raleigh Rapide, Raleigh Record Sprint, Raleigh ZenithRaleigh Stratos, Raleigh Silhouette, Raleigh Europa, Raleigh Medale, Raleigh Supersport, Raleigh WispRaleigh Winner, Raleigh Ace, Raleigh Micron. Phew. Finally, a link to a really good history of the Raleigh company. Thank you for posting this article. I just picked up a 1983 Raleigh Clubman that was in pretty bad shape and I’m restoring it and have been looking for more information on it. It was badly neglected (in Florida) and has a lot of paint chips with some rust, so I’m doing a repaint and keeping the original decals by covering them first. I was fortunate to find a set of OEM front and rear Maillard Spidel quick release skewers on eBay because the old ones were badly rusted, and I’m replacing the seat with a vintage replacement in tan with matching tape. Oh, and if any readers have badly oxidized wheels, a brillo pad will restore them to like new condition! (A little tip I got from a local bike shop). Anyway, thanks so much for the article and the Pdf. Thanks! Really great to see details on my bike!